Join your local Music Centre today! 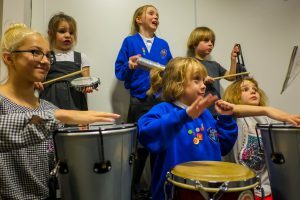 Lancashire Music Hub’s network of Music Centres has been providing musical opportunities for children and young people across Lancashire for over 50 years and have established a reputation for exciting and engaging spaces for young people interested in music. 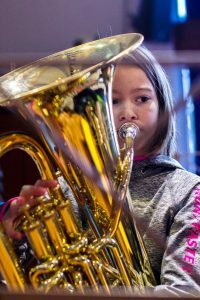 Each Music Centre provides regular, after-school opportunities for young musicians of all levels of experience to play together in ensembles, as well as offering group and individual tuition. So, what happens at a Music Centre? 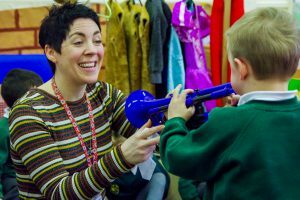 Making music is most fun when you can play together with others and Music Centres are both for young people who want to learn a new instrument or who are already playing. From samba to strings, concert bands to choirs, every Music Centres offer a range of ensembles for young musicians at all levels. Some are suitable for those with no previous experience, others are designed to follow on from learning an instrument in school through Whole Class Ensemble Tuition, and we also provide ensembles suitable for those with a little more experience. 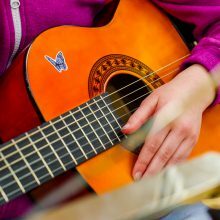 Each Music Centre has a range of experienced teachers offering instrumental tuition in woodwind, strings, brass, guitar/ukulele and percussion/drums. Vocal and music theory tuition are also available at some of our centres. How do I find my nearest Music Centre? Visit the Make Music section of our website by clicking here. You will find all our Music Centre’s there or you can search by location to find one closest to you. Contact your local Head of Music Centre – normally via email or phone and they will arrange a good time to come for a free taster session or to simply call in and be shown round. Fees are from £45 per year (access to all ensembles), its an ideal way to get into music making – you can hire an instrument too. You can download the Music Centre brochure here which gives more detail on what to expect and a list of local Music Centres.